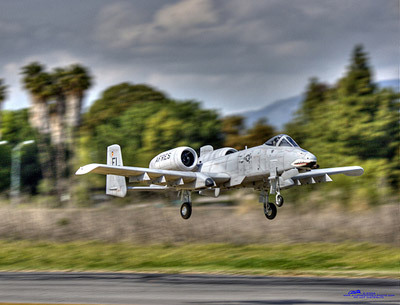 Grab Shot 41 - "Jet Landing"
"A few months ago, I was at a model airplane meet in the Los Angeles area," said Allen Rockwell. "All of the radio controlled models were turbine powered. I was impressed by their realism. Here's one that I captured on a landing approach." The photo was taken with a Canon 30D and a 100-400mm IS lens at 400mm. Processing was in Apple Aperture, Photomatix Pro (for HDR processing), and Photoshop CS2.